Oakland First Fridays is an immersive art and community experience on the first Friday of each month from 5-9p. for five huge blocks on Telegraph Avenue from West Grand to 27th Street. Oakland’s KONO district (Koreatown/Northgate) springs to life with for this event, with galleries, artist collectives, street artists, local culinary artisans, performers, musicians, dancers, DJs, and poets gathering for Oakland First Friday events. What else is going on? How About Art Murmur! Taking place at the same time is the Oakland Art Murmur, a collection of galleries and mixed-use venues many of which are open First Friday evenings. The range of artistic exhibitions is inspiring. Most of the venues are open from 6–9 pm. Many of the galleries are adjacent to the Telegraph Avenue site of Oakland First Fridays on 23rd, 24th, 25th and 26th Streets going east toward the hills. Oakland First Fridays is free and open to the public! But we rely on community support to keep our festival alive! You can make a donation online here, or at our festival entrance on West Grand & Telegraph Avenue. When does the street festival start / end? 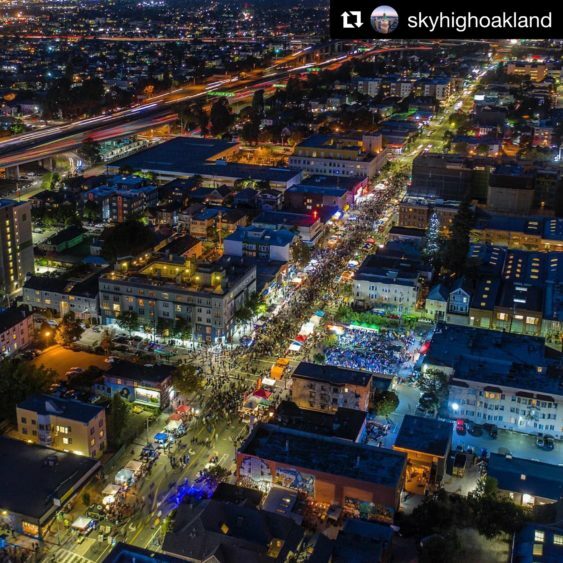 Oakland First Fridays Street festival happens on the first friday of each month, from 5pm – 9:00pm. If the event becomes cancelled due to rain, an announcement will be made Wednesday the week of the event. Check back on our website or facebook page for updates. Where is Oakland First Fridays located? Our festival entrance is located at the intersection of West Grand and Telegraph Avenue, and spans 5 blocks down to 27th Street in Oakland’s KONO District. View the location on google maps here. Our festival is wheelchair accessible and family friendly. People of all ages are welcome to attend. If bringing a dog, it must remain on a leash at all times. Our events bring over 30,000 attendees, so expect large crowds, and amplified sound from our multiple stage and performance areas. There are Porta Potties available on 23rd St, 24th St, 25th St and 26th St. For exact locations, check out our festival map here. We recommend taking public transportation to Oakland First Fridays. The closest Bart Station is the 19th Street stop, which is only a few blocks away. The 12 (Grand Ave. & MacArthur Blvd. ), 51A (Broadway), and 6 (Telegraph Ave.) AC Transit buses also come right to the KONO District. On weekdays and weekend evenings, the free Broadway shuttle runs every 12-15 minutes up and down Broadway from 26th to Jack London. Oakland First Fridays’ pick up and drop off location is located on Valley and 23rd street. Limited Metered parking is available on side streets near Telegraph Avenue, so make sure to bring quarters! If you chose to park on the street, we advise you to not leave any valuable items inside your car. If you’d rather park in a garage, here is a list of garages close by. Alcoholic beverages are served exclusively within our Sake Garden, located in front of Gogi Time at 23rd St and Telegraph Avenue. Otherwise, no alcohol is allowed at the street festival. We do not tolerate the consumption of alcohol in our festival streets. If you’re interested in drinking alcohol, we advise for you to visit our Sake Garden or one of the many bars and restaurants in the KONO district. Drink Responsibly. Volunteering is a great opportunity for you to connect with your community, work as a member of a team, meet new people, and gain references for future employment or academic advancement. You’ll also get free food and a t-shirt for volunteering. We have in-office and day-of-event volunteer positions. For more information, visit: http://oaklandfirstfridays.org/volunteer/ or check out our volunteer orientation video! What to do after the Festival?